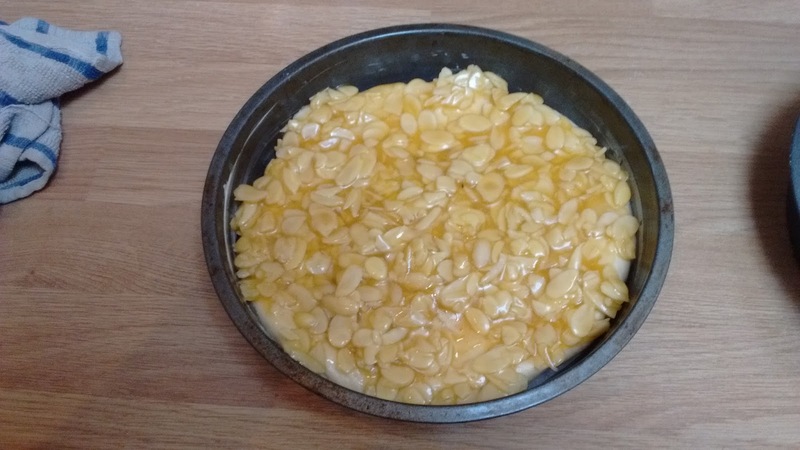 This German cake translates as Bee Sting Cake, a name supposedly earned by a legend that the baker who invented it was stung by a bee attracted to the honey in the topping. I'll make sure to keep the windows shut when I make this cake just in case but I've never been stung by a bee. Much to JD's amazement (displeasure?) because bees seem to seek him out. 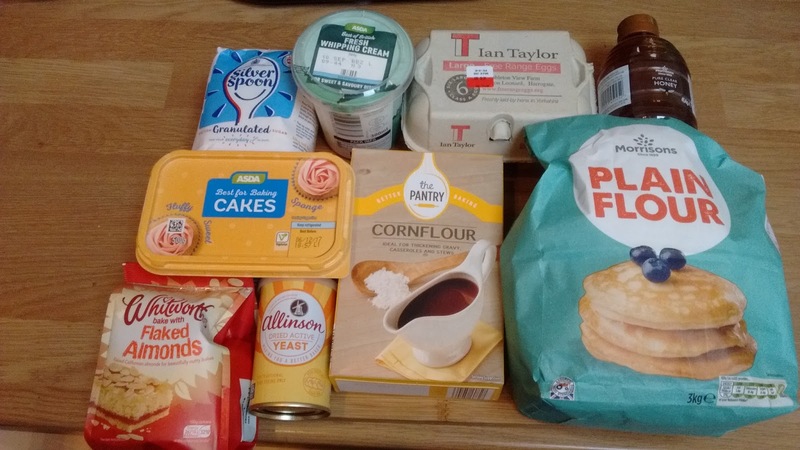 I decided to include this cake on my blog because it's quite different, it's made from a bread-like dough rather than a batter and is filled with an almond cream pudding. Mix together the ingredients for the cake. I did it in my stand mixer because I've been using it gratuitously since I got it. 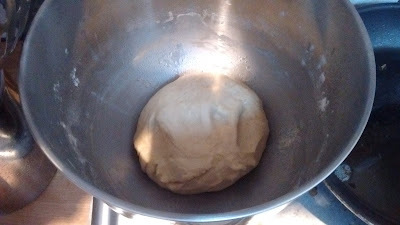 Mix it with the dough hook in the mixer or knead by hand until it's smooth and elastic. Cover and leave somewhere warm for an hour until it's doubled in size. While the dough is rising you can make the topping. 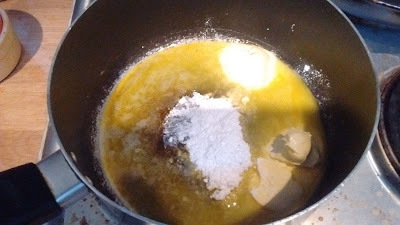 Melt 3 tablespoons of butter in a small pan and stir in the icing sugar and milk until dissolved. 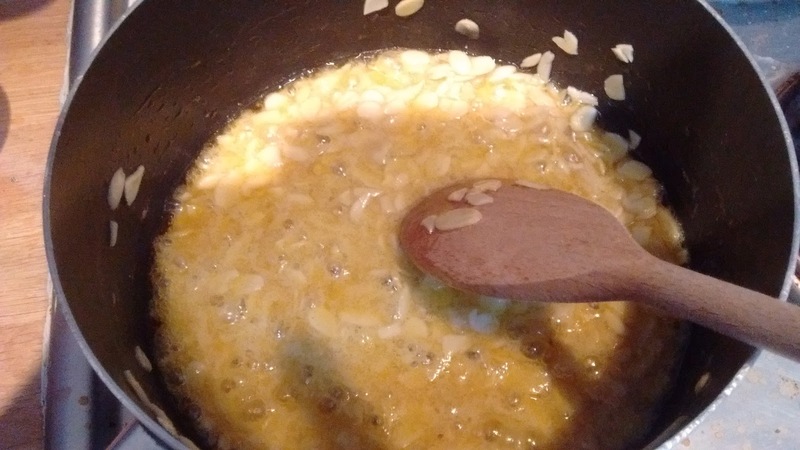 Add the almonds and honey then continue to cook until it boils. Take off the heat and save for later. When the dough is ready, punch it down and roll it out into two circles. 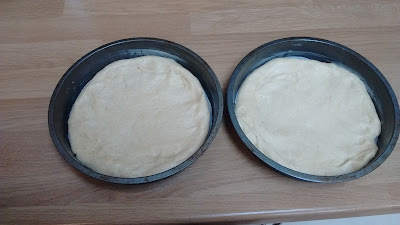 Place each circle into a greased cake tin. Add the almond mix to the top of one half. Bake in the oven at 205C for 20-25 minutes until the almonds have turned golden brown. Leave to cool. Now it's time to make the filling. 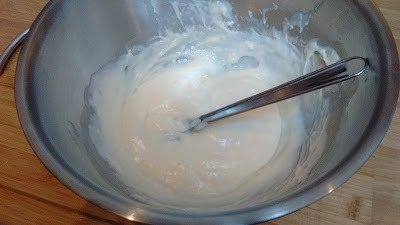 Dissolve the cornflour in a little bit of milk. 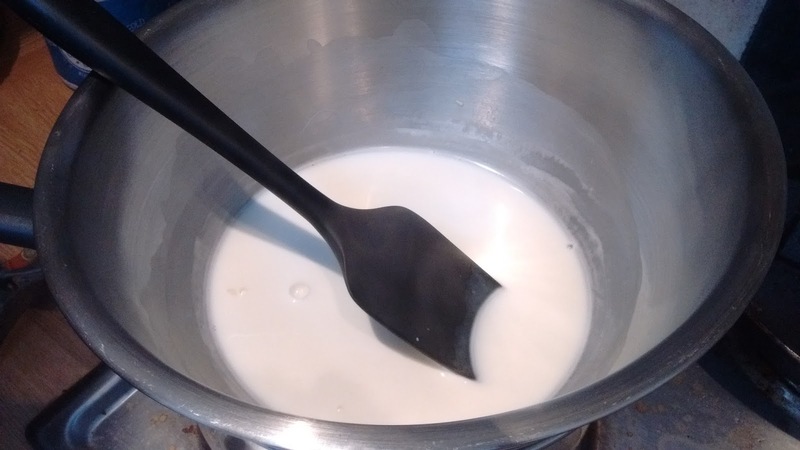 Add it to a bowl on top of a pan of hot water along with the rest of the milk and the sugar. Stir constantly as it starts to thicken. Take it off the heat and stir in the beaten egg and almond extract. 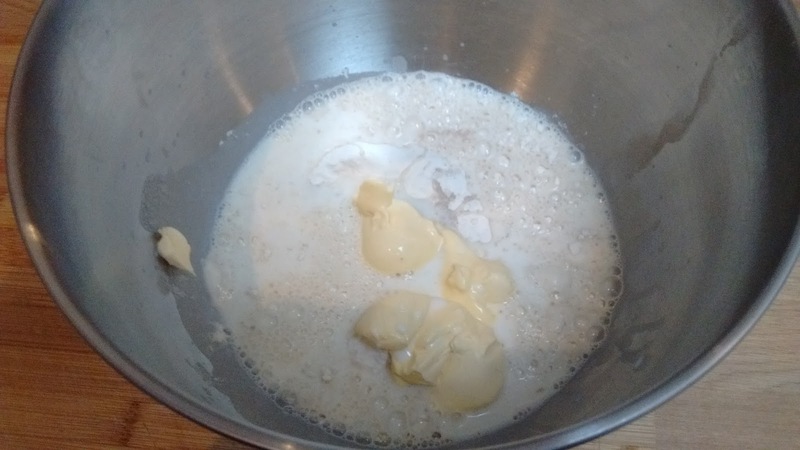 Chill this pudding mixture in the fridge for an hour. When you're ready to make up the cake, whip the cream with the cream of tartar until stiff and then fold into the pudding mix. Spread the cream filling on the bottom half of the cake and top with the almond crusted half. 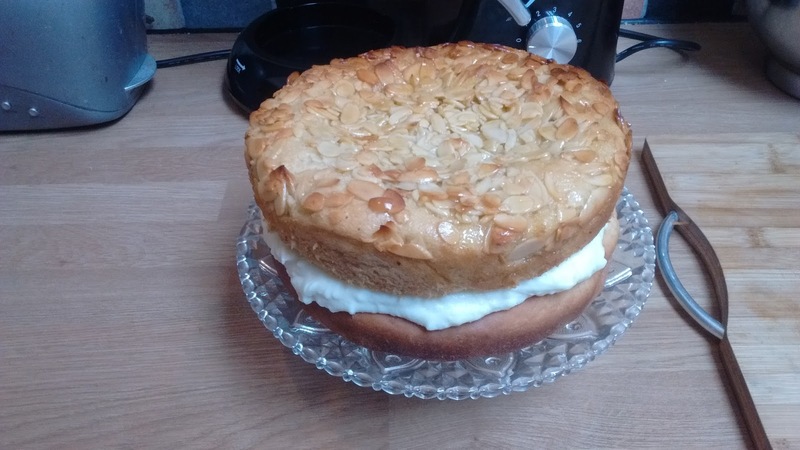 This was a really interesting cake, it was bready in texture with a lovely gooey layer on the top under the almonds. The cream filling added to it's overall lightness. It was really difficult to slice though and the top slid off when we'd eaten half of it. Leigh and Erin really enjoyed it and had seconds immediately. 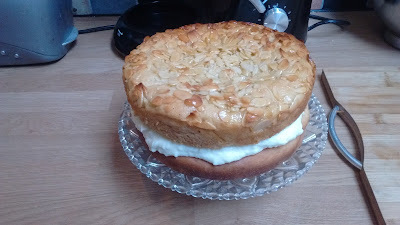 It was nice to try a different style of cake than the usual sponge we normally have.